While endowments and foundations are optimistic about 2018, many believe a number of risks―including rising rates, slowing economic growth and geopolitical uncertainty―threaten performance moving forward. These concerns could already be driving increased adoption of risk management practices. In a recent survey by Mercer, nearly two-thirds of endowments and foundations (61%) said they are using stress testing or scenario analysis for risk purposes, up from roughly one-third (36%) five years ago. In fact, Harvard has sent the clearest signal of a renewed focus on sound risk management, with new Harvard Management Company CEO Narv Narvekar recently introducing a new risk allocation framework that places emphasis on better understanding, evaluating and dealing with portfolio risks. The aim is to boost risk-adjusted returns, which makes sense, but more on that later. Managing risk hasn’t always been the central focus for large endowments, though. In fact, for more than half a century, endowments have been slowly moving away from an emphasis on risk management. In the late 1960s, what is now referred to as the Barker report, advocated for endowments to shift their investment objectives from sustaining income to maximizing long-term total return. Slowly, endowments began downplaying the importance of risk as they shifted toward higher-risk, higher-return strategies. That trend gathered steam over the next couple decades, culminating in the birth of the Yale endowment model, spearheaded by endowment CIO David Swensen. The model embraced the risks inherent in illiquid and less efficient markets―such as private equity, real estate and natural resources―while trying to harvest the premiums paid for those risks over the long haul. Other endowments, specifically Mr. Swensen’s Ivy League peers, followed suit. The idea was that, unlike other institutional investors, endowments have long horizons, which allows them to weather short-lived market disruptions. On top of that, the active rebalancing taking place during volatile periods by Yale and other Ivy League endowments, provided an opportunity to further boost returns. 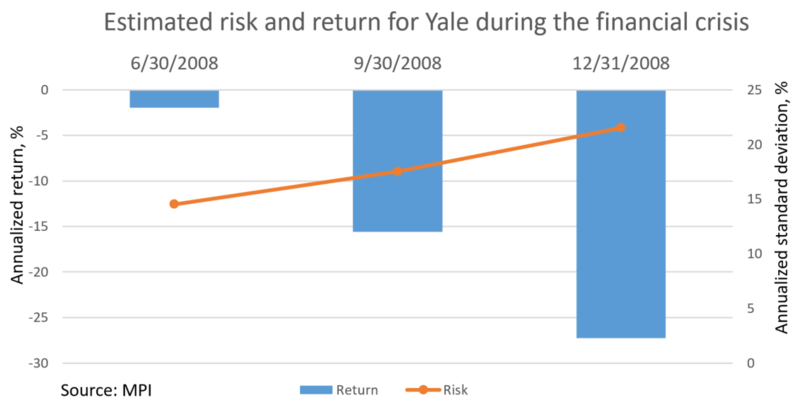 And indeed, for many years the endowment model worked very well, allowing Yale and other Ivy League schools to earn consistently high returns that outperformed most public benchmarks, leading the industry to focus more on their abnormally high returns and less on the hidden risks that some of illiquid investments in Ivy endowment portfolios carried. Yale, in particular, maintained an impeccable ten-year record for many years. 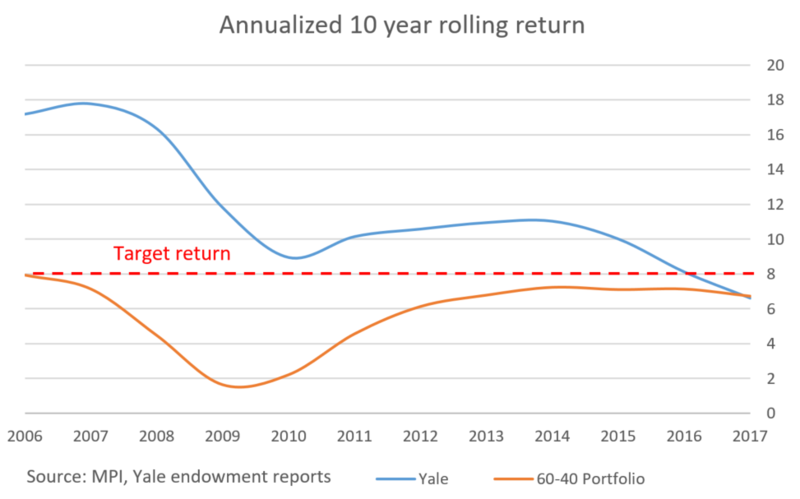 Based on Yale’s more recent rolling 10-year track record, however, performance no longer meets the target return that many endowments need to achieve in order to break even after inflation and expenses are taken into account1 and it no longer beats a 60-40 portfolio, as displayed in the chart below. Although last year’s Ivy League endowment returns reversed the disappointing results from fiscal year 2016, they were only marginally better (12.6%) than the 12.2% average return across all U.S. college and university endowments, according to a recent report from The National Association of College and University Business Officers (NACUBO). 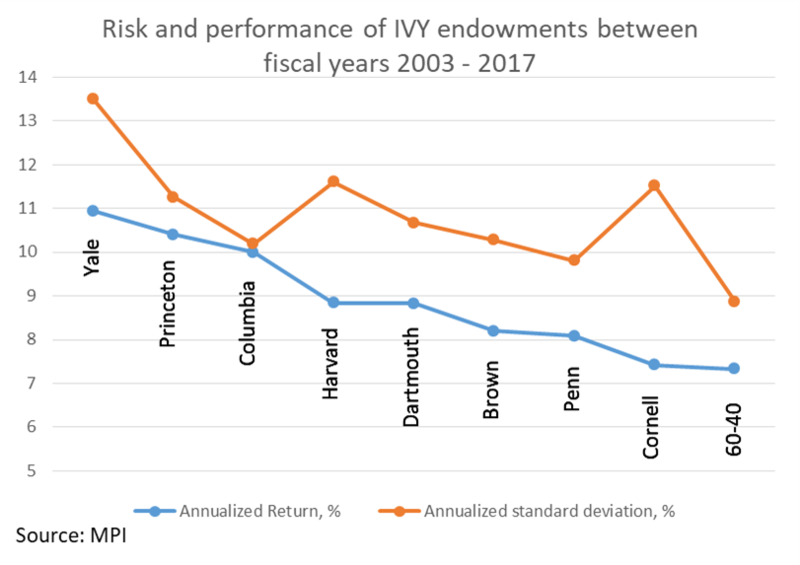 Some of the Ivy endowments have received criticism over those returns, and the latest report from NACUBO could provide more ammunition to naysayers. Given the recent Ivy endowment performance numbers, one is left wondering whether they are well-enough positioned to achieve superior risk-adjusted returns that will enable them to weather anticipated market risks. We recently looked into that question, which was the basis for a larger academic paper we recently published titled, “Alpha and Performance Efficiency of Ivy League Endowments: Evidence from Dynamic Exposures.” In that paper, we find that, while Ivy endowments do earn significant premia by investing in illiquid asset classes, the risks they take to achieve this are likely quite large, resulting in portfolios that may not be as efficient as previously thought. Although it is generally known that the assets endowments invest in are risky, quantifying such risks with any precision has remained challenging for industry practitioners. The illiquid nature of venture capital, leveraged buyouts and real estate―combined with the large allocations to those asset classes―make it hard to estimate the true risk tied to observed returns. Additionally, the fact that portfolio returns are only available annually to the public means that they are too infrequent for reasonable risk estimates. We set out to address this challenge and develop a basis for measuring endowment risks. To do this, we developed a three-pronged approach. 1. Mimicking endowment portfolios: Using published annual performance data we constructed factor mimicking portfolios for each Ivy endowment via our patented Dynamic Style Analysis2 model, which enabled us to use a set of indices that correspond to the asset classes commonly disclosed in annual endowment reports. Because these factor portfolios closely replicate observed endowment performance, we use them as proxy series to estimate endowment risk. 2. Accounting for illiquid investments: Given the illiquidity issue mentioned above, some of the selected factors―such as private equity, venture capital and real estate―are artificially smooth, which would cause us to underestimate risk. To address this issue, we apply a de-smoothing technique, which improves risk estimation. 3. Risk Measurement: We then use private equity, venture capital and real estate factors that are generally available (indices measuring the broad returns of these private market segments) to achieve a sufficient number of data points to produce meaningful risk and drawdown estimates. This approach also allows us to monitor endowment performance and risk intra-year, before the final performance numbers are available in the autumn, which gives us valuable insight into these otherwise opaque portfolios. We then applied this approach to analyze how these portfolios performed during the financial crisis. On the eve of that crisis, Yale endowment estimated the risk of its portfolio to be 12.8%. The following fiscal year (July 2008 – June 2009), Yale fell by 24.6%, an event that is beyond two standard deviations from the mean. When applying our performance measurement approach, however, the estimated max drawdown experienced by Yale within that fiscal year was actually a lot higher―a whopping 35.8%, compared to 49% for the S&P 500 and 26.3% for a 60-40 portfolio (all being estimated quarterly). Moreover, we are able to see how the risk/return dynamic changed as the crisis unfolded (see below chart). When Yale lost 25% of its market value during the 2008-09 financial crisis, Swensen was quoted as saying: “I’d rather have the best 10-year record than the best one-year record.” And indeed, for the years that followed, Yale was ranked at the top of its peers in terms of 10-year rolling performance or overall performance across the period we examined. But as our findings now indicate, the best record was also accompanied by the highest estimated risk. We find that most Ivys take on risks that are considerably higher than their returns, according to our estimates. Princeton and Columbia seem to be exceptions to this with returns that almost match the risks they take – being the most efficient. The findings for Cornell on the other hand are gloomier, with significantly higher risk for the achieved return. When calculating Sharpe ratios for endowments based on the portfolios composed of proxy market factors that we constructed, we find that these range between 0.56 and 0.85. By comparison, the Sharpe ratio of a 60-40 portfolio over the same period was 0.69, which is in the middle of the range. What is not being advertised here is how much risk they may take in the process. This apparently is significant, resulting in portfolios that are not all that efficient. In today’s increasingly more fragile markets, as we were reminded during the recent spike in VIX and “tariff tantrum” events, it is important that investors in alternative asset classes that mimic the endowment model understand and carefully manage the risks. After all, such investors may not have the luxury of long horizons that allow endowments to weather significant market downturns and volatility. They may also lack the expertise and resources required to invest in alternative asset classes―e.g., due diligence abilities, risk and portfolio management, etc.―that the Ivy league endowment investment offices have built over time. 1This is commonly quoted as CPI+5%. Based on 2017 average spending rates and the Commonfund Higher Education Price Index (HEPI), this number is 8.1%.